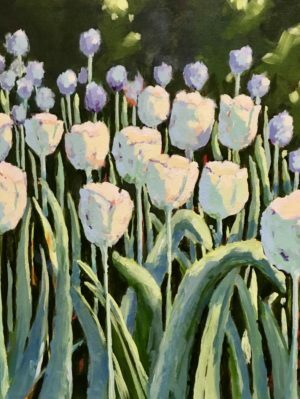 Loved the way the white tulips stood out against the darker foliage. The blueish flowers in the mid-ground and the slightly blurred light in the background pushed the whites forward. 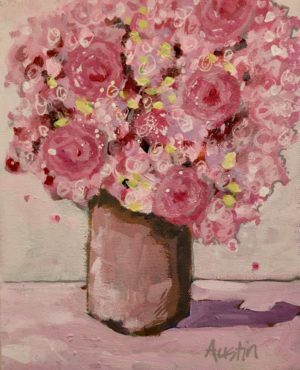 A small bunch of whimsical flowers to more than fill the canvas, all pinks and all on a pink background. This one was just plain fun to paint! Flowers set in a mason jar, seems to a bit of theme for me when I have been painting flowers. 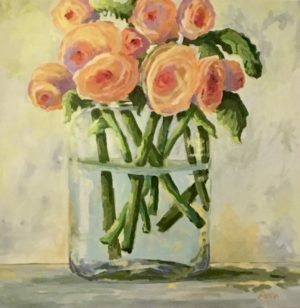 The flowers in this painting are called Ranunculus and they can grow in your garden from bulbs. Ranunculus flowers used in the floral industry typically have loads of petals tightly wrapped around the central core. 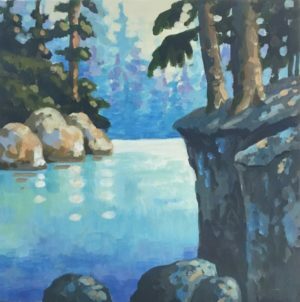 The shadowed cliffs and rocks alongside the river are a perfect frame for the light. The light finds its way to the water and warms up the rocks on the opposite side of the river. A clear clean river of sparking light. 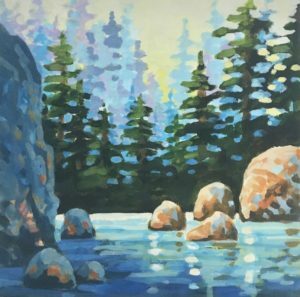 My inspiration was from the Capilano River.